You can create create 3DLUT of the image convertor or color correction software by using WonderLookPro generated still image. If you are going to make 3DLUT of the transform of SDI input/output device, you have to use two IS-miniX. If you are going to make 3DLUT of the transform of grading software, you should prepare DPX image file from WonderLookPro. Connect the devices as follows. Select the input IS-miniX and send "Image to Create LUT" image. First, click the combobox above image area. 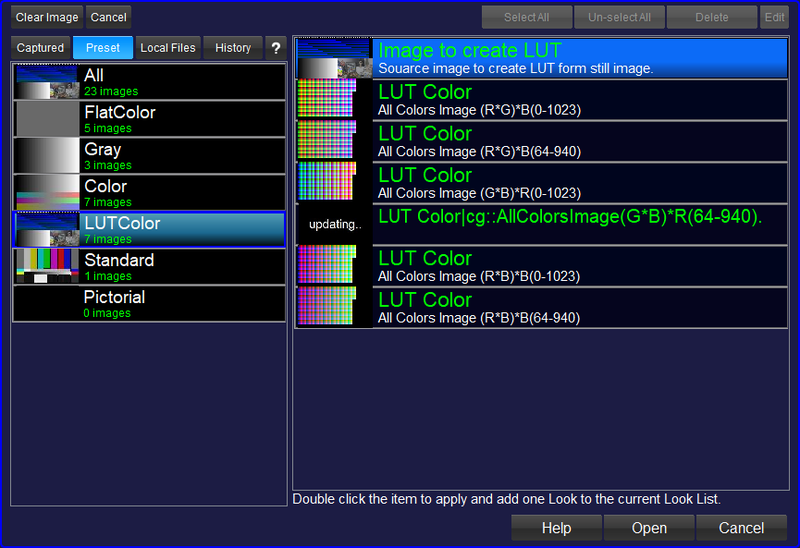 After showing up following dialog, please select "LUTColor" and "Image to Create LUT". ①Comfirm that "Image to Create LUT" was loaded. ②Confirm color pipeline is consist from No Scaling and NoLUT. If not, please click NO LUT button. ③Confirm that the system tone curve is 45 degree straight line. If not, please reset the Look. ④Click "Send" button to send the image to IS-miniX to be output. That's the preparation for the input IS-miniX. 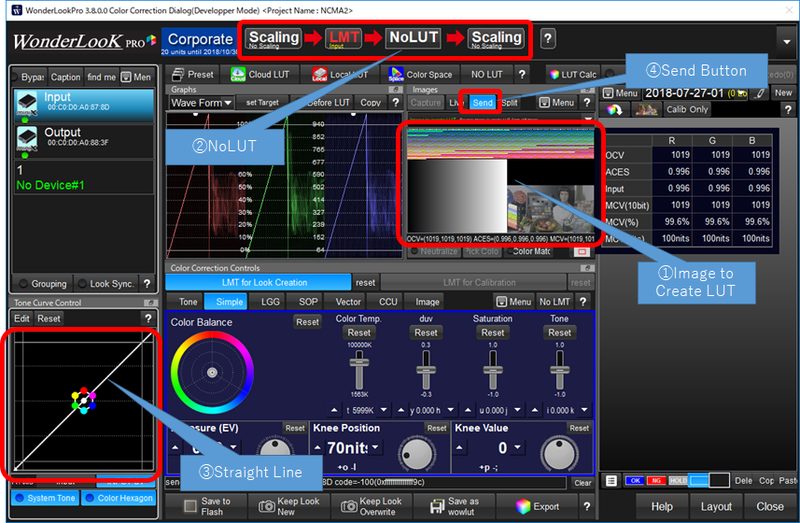 ②Confirm after processed "Image to Create LUT" was receiving. 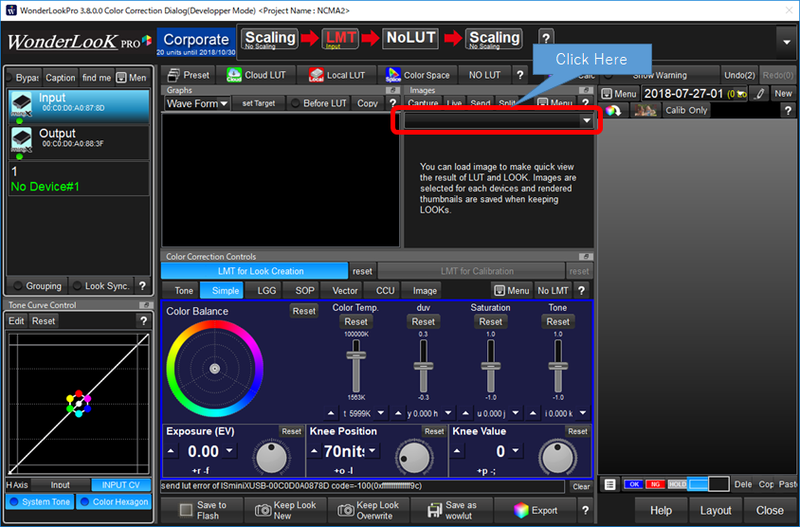 ③Click Capture button to show the LUT saving dialog. You can create .cube format LUT file. ① Save "Image to Create LUT" image as DPX format. ② Load into Grading Software, process image and save as DPX file. ③Load the DPX file into WonderLookPro. ②Select "Create LUT from Image"
You can save the created 3DLULT into .cube file.